Note:The tips below, though still solid, may be outdated. For example, here you will only find a strategy for only the original Huttball map. But, after going through it, it's still a solid and informative read that can and will aid you in thses WZs. Updates will be coming soon. Why are we fighting over a planet that's going to blow up anyway!? Out of all the Warzones, this one yields the most potential roles for an Operative. You can play Defense, Offense, or be a Nuisance and still end up helping the team one way or another. Having all these options, make this Warzone one of the most diverse and interesting ones for an Operative. Let’s take a closer look at these roles. Your goal playing as a defending Operative is to make sure your node stays yours. The key to successfully defending a turret is position. You do not want to be ON the turret nor at clicking range of it because a stealthy might CC you and take it under your nose. A good position to be at for the side turrets is on either of the side stairs or in the grassy/snowy area off the platform. For the middle turret, try to stay either up the ramp, overlooking the node or underneath that spot where a small passageway is located. Note: No matter which location you choose, make sure you can see the entirety of the node! Sometimes you get a stealthy try to ninja cap and due to LOS issues, their nameplates will not show. When an opponent is nearing, make sure to pop Sneak for enhanced stealth. The last thing you need while heading to the capper to stop him is another stealthy catching you first! So, remember to sneak! Once you’ve successfully CCed him, analyze your situation. Are you alone? Is HE alone? If it’s a 1v1 situation, call one team member for reinforcement (better safe than sorry). If its >1, call an incoming with the number of attackers. For example, “Inc mid 3!” It’s short, to the point, quick to type, and with it you’ve just alerted your team that 3 visible attackers are incoming to the middle node. When reinforcements arrive, you’ll be in all-out war. As the war slowly dies down, if you notice that your team is beginning to greatly number the opposition, and you see no enemy reinforcements incoming, and you have 2 nodes, it’s time for you to go reinforce the other turret immediately. Do not wait for an “Incoming” call. It is obvious that the enemy is headed there next. Head over and keep guard until an inc is called from either side. Let the war continue! When it comes to playing offense in this warzone, there are two effective play styles; the Enforcer and the Capper. As the Enforcer, your goal is to provide backup for the node being focused. When backing up your platoon, you need to focus on a few things to make the attack successful. This is actually a little more complicated than it sounds; reason being that there’s usually more than one healer. The first thing you should do is mark the healers. Once they are marked, pick one as a focus target. When you and your team pounce the healer, keep an eye on how the health pool moves. If the heals are outdoing the damage, peel off and distract the other healer. Remember, you have two combat stuns (Debilitate & Flash Bang) and one interrupt (Distraction). Three stuns if you put points in Jarring Strike, which gives your Hidden Strike a chance to knock your opponent down for 1.5 seconds (50% chance with 1/2 points, 100% chance with 2/2 points). 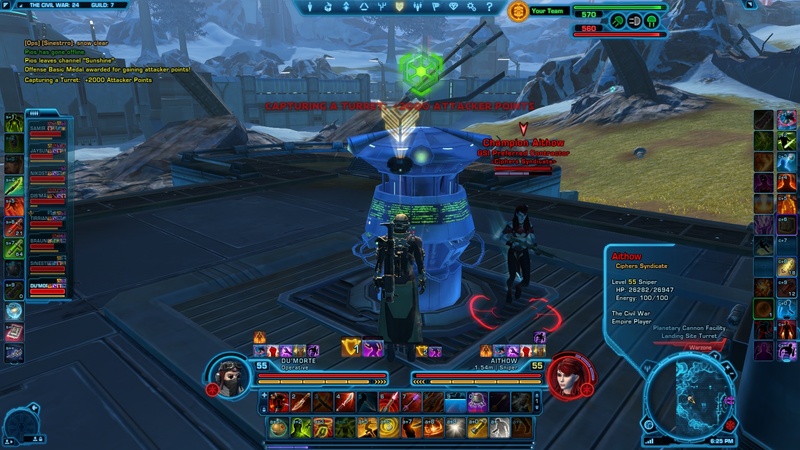 When stun-locking the healer, keep an eye on their resolve bar. Save the interrupt for after the resolve bar is fills from two stuns. Hopefully, your teammates will have been able to burn the healer down as you kept the other one at bay. Then, make the remaining healer wish they rolled a tank. This is called a Warzone for a reason. Comparing e-peen sizes with the opposition with 1v1s will only deter the objective from being captured. Plus, you’ll never be able to complete a 1v1 anyway. Someone always joins in in the fun. The only time you can 1v1 is if you and your opponent are the only ones fighting over a node. When this occurs, you should still call for assistance. While at full scale war, stealth, sneak around, and find yourself an enemy who’s already being beaten on. Usually, I would look at my teammate’s health bars and whoever’s is lowest is who I help. With your various stuns and burst dps, the enemy will not know what hit him and your dying friend will greatly appreciate it! Of course, remember to target healers first! If you find yourself on the verge of winning a node, peel off the battle and head to the opposition’s backup. You will see the red names running to your node to try and stop the cap. What you do here is go into stealth, run to them and Sleep Dart them as they near. You can only have one Sleep Dart up at a time so hit the closest enemy with it. If you have several more incoming, wait until they are a few meters from each other and Flash Bang the group. You also have the Debilitate and Sever Tendon abilities to stall their attack, so use them as needed. As the Capper, your goal is to, wait for it, capture the node! Who would’ve guessed!? Believe it or not, this is easier done when you’re the only one present. But, you have to be patient. You will usually have to wait until after one of the nodes is being fought over. 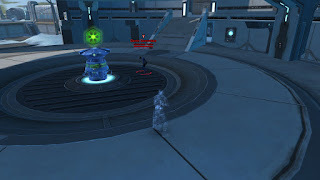 When that occurs, the other team will send more reinforcements to the node, ultimately leaving one to two defenders. For the Capper role to be effective, you have to hope that there is but one defender. 1) You have 2 stuns you can use before your opponent becomes immune. 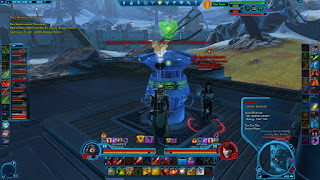 2) It takes 8 seconds to capture a turret. 3) Your longest stun, Flash Bang, lasts 8 seconds. Keeping all this in mind, you will have to rely on positioning to capture the node. So, here is what you do. Head to the enemy who should relatively be close to the node; if he’s not, give it a few seconds to see if he decides to run around it from boredom. When he gets to clicking range of the node, Debilitate him. This will take you out of stealth so immediately click the node. The stun is only 4 seconds so you will not capture it. The reason for this move is to scare the enemy into popping his CD to remove immobilizing effects. Once he pops it, move to side of the turret and Flash Bang him. Flash Bang has a 10 meter range so you should be able to do this no problem. The goal here is to have the turret in between the both of you a split second after Flash Banging him. Once you’re in position, click the turret. Remember, it takes 8 seconds to capture the node and the CC wears off in 8 seconds as well, so, the fast you get to the other side and click the node, the better. If you timed it right, your enemy will not have enough time to stop your cap. But, you HAVE to have the turret in between the both of you for LOS. LOS is key. Once you capture the node, pop Cloaking Screen and follow up with Nuisance mode. There is another method to go by capping the node. It's pretty much exactly the same as above, only instead of using Debilitate, use Sleep Dart. It's an 8 second sleep but it keeps you in stealth. So, the way to affectively do this is to Sleep Dart your enemy a split second before you get into position (reason being that if you're in the right position, you'll have LOS issues). Once you Sleep Dart him, immediately click the stealth off and the click the node. If timed right, you've earned yourself a Sap Cap. Note: Though I've used both strategies, personally, I find the Debilitate strategy more effective, but that's only because of my play style. Both strategies are effective though! Credit goes to Ilmarinen of the ConcealedBlade forums for the Sap Cap tip! Your job as a nuisance is not complicated. Your goal is to stall the opposition until your reinforcements arrive. Your bread and butter here will be Stealth, Sneak, and Sleep Dart. As you defend your newly acquired turret, yell out for reinforcements because you will have a horde of your opposition headed there soon. As your team arrives, Sleep Dart anyone who clicks the turret. Remember, you can only CC one person twice before their resolve makes them immune so time your CCs and attack when you need to. Then pop Cloaking Screen again and continue being a pest to the enemy until your backup arrives! PVP as an operative, in my opinion, is just plain fun. There is no role you can't portray successfully. Now, the question is what type of player are you? Would you prefer to play offense, defense, or a mixture of both as long as the objective is completed? I for one tend to switch roles depending on the Warzone. 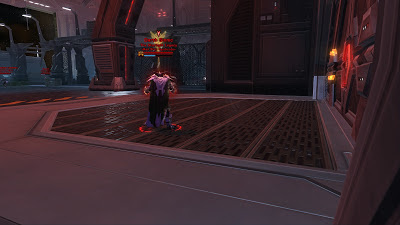 For Huttball, I find myself to be more passive than the other warzones. Of course, this is done for the team’s advantage. If I wanted to be selfish I could just run around and kill players just to get medals. But, I’m in it to win it so, that’s not how I Exfiltrate (Haha, get it? Exfiltrate? It’s a roll! That’s how I roll… I’m sorry). 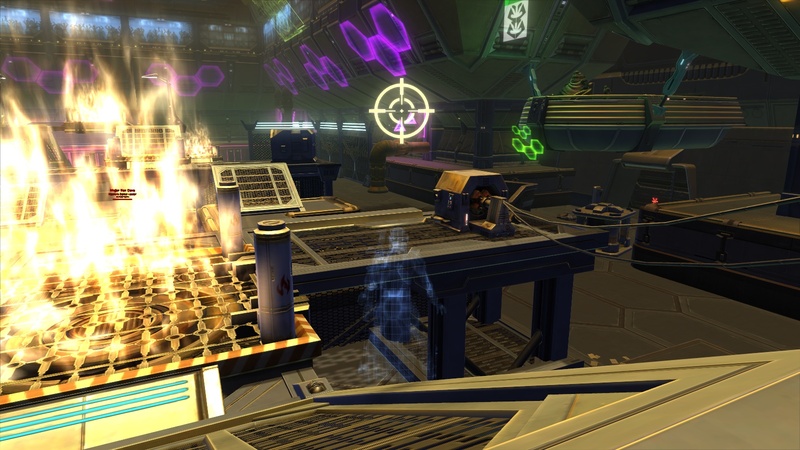 The most goal-oriented and effective role as an operative in Huttball is that of the Stealth Receiver. Your job as the Stealth Receiver is to place yourself in key spots on the map making yourself readily available for passes. Of all the roles, this is by far the one with the least PVP action, but can be the role that wins your team the game. 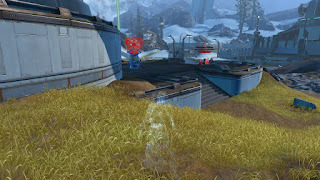 In the Huttball arena, there are 3 key spots to place yourself. Once you have a good idea of the quality of your team and that of your opponents is how you decide which of the spots to pick. To make this spot effective, the ball carrier needs to either get a vent push or run around and go up the ramp and survive the run. The first spot, I have dubbed Hell’s Maw for obvious reasons. It is both a dangerous yet safe spot to park yourself. What you want to do is make sure you are behind the pole, past the fire pit. The purpose of this is to create Line of Sight issues against your opponents. Also, make sure to put a marker on your heard because you will not be the easiest target to spot when the ball carrier is running toward you being pummeled, rooted and pulled by 6 other people all whilst the flames of Hade blaze up into the heavens just inches away from your face. Spamming the spacebar is a nice way to try and grab the ball carrier’s attention too. This tends to be a high traffic area so try to have Sneak active whenever it’s off CD or whenever you see a bypassing opponent. Now, if your ball carrier is any good, he’ll notice the jumping hazy figure with a crosshair over its head and toss it to you. Make sure to get out of stealth AFTER the huttball marker appears under your feet! If you do it too early, a good opponent will pull, stun, etc. you upon seeing you leave stealth. If you click it off too late, you will not catch the ball. So, try to time it. Note: The further the toss, the more time you have to leave stealth. Same goes vice versa. Upon catching the ball, it’s time to get out of the spot immediately. Try to keep a visual on your opponents and where they stand; especially any one of the classes that love pulling their opponents into fire pits. Pop your Evasion and spam Exfiltrate if you have it, or Sneak to speed yourself up. If you have Exflitrate, time the ability so you click it when you’re about a foot or two from the ledge that overlooks the fire pit below. Aim at the ramp that’s past the fire for, if done correctly, you will roll clear past the pit and onto the platform where the goal is but a roll away. B) You are at full health. If you cut it close, pop Shield Probe and hope for the best. To make this spot effective, the carrier just needs to carry the ball past the acid pool. 1) Mark yourself once in stealth. 2) Announce your location to the ops group. 3) Stand right behind the sacks. 4) Use Sneak when you can, for this tends to be moderate traffic area. The ball carrier does not need to travel far to be able to pass to you. All they have to do is get past the acid pool. Once they pass, try to be as far from the ledge as you can, but still be in the ball’s landing marker. This might give you a little breathing room for running. Leave stealth, catch the ball and run straight to the fire pit; pop Shield Probe and Exfiltrate through it. Keep pressing it until you hit the goal. If you’re under Lvl. 52, pop Sneak and Shield Probe and run through the fire. Have a Medpac available to consume after passing the pit and cross your fingers. To make this spot effective, the ball carrier needs to be able to survive running past the acid pool, into the bottom floor and about a fourth way across to the end zone. Probably the most popular and most effective placement for any stealthy is at the end zone. As for me, I like to take it up a notch and make a nook out of the gap under the map. You are so close to danger here that you’re actually the farthest from it. You can get here relatively fast and painlessly if you’re slick enough. When the match starts, run off your end zone and pick up the speed boost, stealth and run up to their side. If you’re Concealment spec, stealth will not slow you down. By the time you reach their first fire pit, the ball should have just been picked up. Sneak past the fires and straight to the ramp. 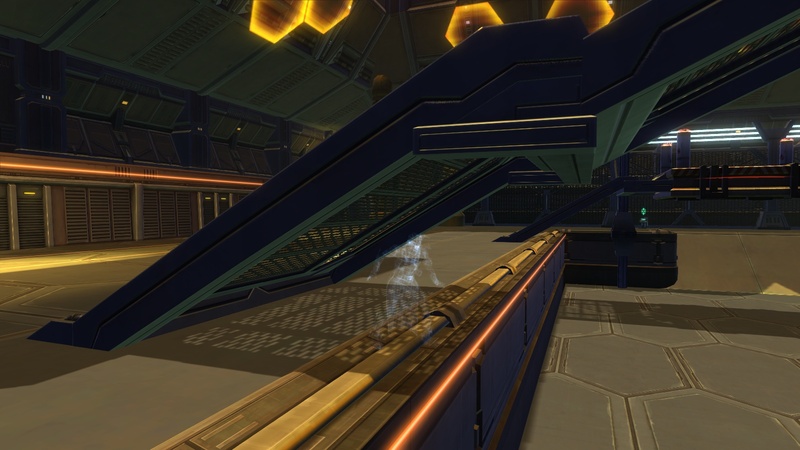 If the ball carrier is good, he should be in the bottom floor under the ramps by now. Make sure you marked yourself and call out your position in ops chat. 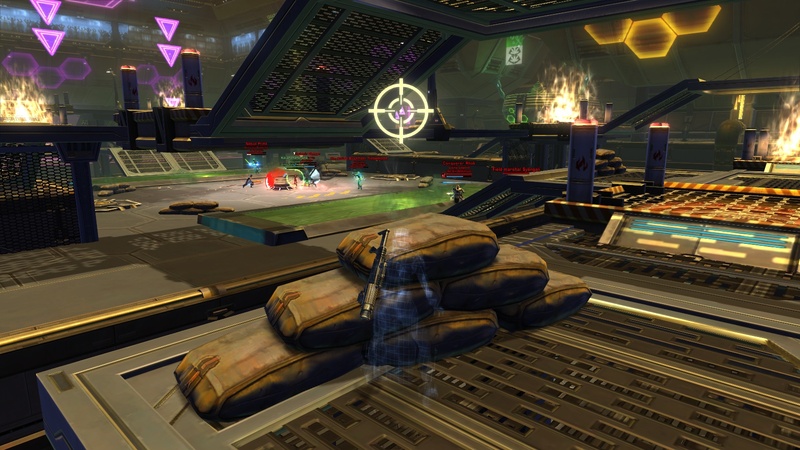 As the carrier makes his way to you, make sure no enemies are spawning behind you! Remember, you are only several feet away from their spawn point. When they toss the ball, drop stealth then run to the end zone for the easy score. 1) Step away from beneath the ramp as the ball carrier nears. 2) Do NOT stand on the ledge! Stay a bit behind to where you can catch the ball but not get leaped on or pulled off. 3) ALWAYS be aware of your surroundings. Last thing you need is to catch the ball just to get pushed off form someone behind you. 4) Drop stealth at the very last possible second. This makes it a lot more difficult to be spotted, targeted, and CCed. The ball carrier only has to be about ¼ of the way to the end zone to reach you from a toss! Make sure they’re aware of that. Of course, this only works if the ball carrier lives long enough to make it down there. It’s actually harder than it sounds hence this is a key setup for good teams. Note: THERE IS NO SHAME IN PASSING! In fact, I encourage it. A lot of times you will find yourself blocked off or surrounded making these strategies somewhat improbable. Better to pack pass the ball or even toss it away then give it up to the other team. As an Operative, the favored role is the ninja bomber. While the teams are at war, you’ll be slyly placing bombs on the doors. Though it’s a rare occurrence, I’ve had games where I’ve walked straight tot every door and successfully opened them until we reached the core with no interruptions; also known as a perfect game. This was accomplished with the incomparable help of Exfiltrate. You can still manage to do this without that ability (for I have done it), but it will just take longer and your chances of being caught increase significantly. Note: The hardest door to sneak bomb is the first one. But, once you get that one, the rest are pretty much gravy. Assuming that all goes to plan, of course. Depending on how your raid leader calls it, you might be alone or accompanied upon attacking. If you are accompanied, make your way to the door and ask your team to provide a distraction for you. Don’t go straight to the door though. Give it a few seconds to make sure that all opposition is occupied and facing away from the door. This is when you click the door to place the bomb. 1) If you have enough space to stand between the door and the defender, odds are you can ninja that door without ever disturbing your opponent. 2) You can CC him long enough to click the door and plant the bomb. The way you would want to CC him is using Debilitate and the click the door to make him pop a CD, then Flash Bang and click the door for the successful plant. Make sure he's not facing you because the CC will wear off about 0.2 seconds before your cap! Whenever a bomb is planted, whether by you or another, make your way to the side with the least people or the most friendlies. 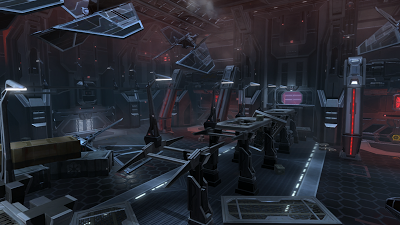 Stay in stealth and as the doors pop open, Exfiltrate to the console. Open the bridge, stealth and run/Exfiltrate across the bridge and head to the OTHER door since opponents tend to go to the door where the bridge has been opened. Usually, you will be left alone and unnoticed so you get to place the bomb. Make your way down the corridor and down to the farthest console as soon as possible. Open the console, jump down, click the farthest door and you should get it as long as all goes down smoothly. Odds are that they won’t, but if they do, you’ll be golden. When things get ugly, pop Cloaking Screen and time your door clicks wisely. This Warzone is, by far, the most difficult one to get away with a stealth cap. Reason being, in order to self-cap it, you have to channel a stream for about 10 seconds, more or less, without being interrupted. Plus, the initial click takes about 2-3 seconds to begin the channel. Then, as you’re capping, the image of the node on your UI changes to your color, sharing to everyone in the warzone that node is being captured. So, in summary, you need to be able to stealth into the room where the console is located, channel a stream for about 13 seconds, and hope that no one is noticing the cap on their UI. Though, this is possible to do (I have done it), it is highly unlikely. If you want to give this a shot, read on. If not, skip the Solo Cap portion. Note: The following strategies are best used at the start of the fight. The best time to attempt a solo cap is at the start of the battle, reason being that most teams send 1 person to capture the NE/NW node as the other 7 charge the South node for war. Your goal here is to get to that Northern node farthest from your spawn (NW for Empire, NE for Republic) as fast as you can. Exfiltrate off the ledge at the start for a little boost then make your way to the node. While you run to it, make sure to go into stealth. We don’t need out red name being spotted from afar by the other team and then they call for backup. As you make your way, keep an eye on the UI and notice how fast their node is being captured. If it took about 8-10 seconds to capture, that means they only have 1 clicker, which hopefully means they also have 1 defender. Once you arrive, assess the situation. You can either 1v1 the enemy or attempt a stealth cap. My preference is if they’re right next to the console, I get between the two and click it first. If and when I’m spotted, the 1v1 commences. If they’re away from the console, I go straight for the 1v1. If you win, click the console and hope for the best. If you don’t, it’s back to the drawing board. 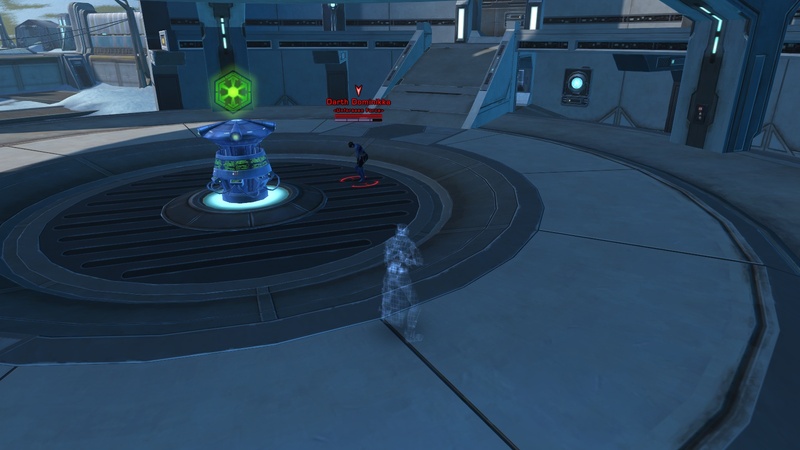 Note: When attempting to cap, place yourself in the inner far corner of the node to keep yourself out of your enemy’s LOS. b) Distracting the defender while the other member caps. Of both options, I’d suggest the former because most of the time the defender will know it’s a distraction and take a swing at the capper, and since it only takes a hit to cancel a channel, it truly would be a waste of time not burning them down. Same as Duo-capping, but with 3-5 people. The point of this is to face roll the sole defender and cap as quick as possible. Be careful of this strategy though because when your opposition only sees 2 people heading to the middle node, they’ll immediately know what your team is up to! Now that you’ve initialized the warzone, it’s time to go to full scale war. In the midst of the battle, your role will tend to change depending on our play style and if you prefer to play offense or defense. Playing defense in the Novare Coast is really straight forward. But, there are also several ways to play it. Two of these ways are playing the roles of The Camper and The Recon. b) You can move the camera to see the other nodes. 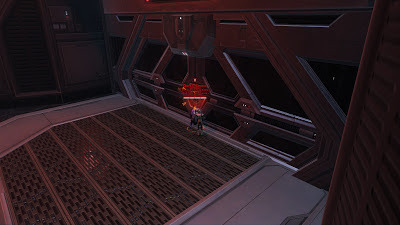 Stealth cappers like to place themselves on the far inside corner of the room and click the console so you need to be able to see these edges clearly. As long as you have your area sight appropriated and call incomings when needed, you should be good. Call “incs” immediately upon spotting them. DO not wait for their arrival nor engage the enemy first because it could be too late by then. As the Reconnoiter (Recon for short), there will be a lot of movement involved. Reason being that your job is to observe the playing field between your nodes for inevitable attacks. Many teams like to divide their forces between their nodes by two teams of 4, and mathematically, it’s a good idea, realistically, it’s not. This is because the opposition is not going to send 4 people to attack one node and 4 to the other. They will concentrate on one. For this very reason, it’s better to keep 2-3 people per node and keep the remaining people running back and forth to whoever needs the help. As you run back and forth, you may be attacked in the middle ground. DO NOT engage enemies in the middle! While the backup is fighting the distraction, your node may be overrun and taken by the time you kill the opposition and make your way to that node. The best thing to do is CC them and make your way to the node under attack. That way you can interrupt any attempted caps while fighting. There are two ways you can go by the offense as an Operative; objective-oriented or as part of the angry mob. Both have their pros and cons and both can work if done right. The only issue with the former is that it’s rather situational, when the latter is usually the traditional way of an assault. The goal of the objective-oriented offense is to attempt to cap the node underneath their noses. Though you could do it alone (with a lot of luck), it is best done if you go with a group of 2 or 3 people. In this way, they provide a distraction and peel enemies off the console while you swoop in and click that console. 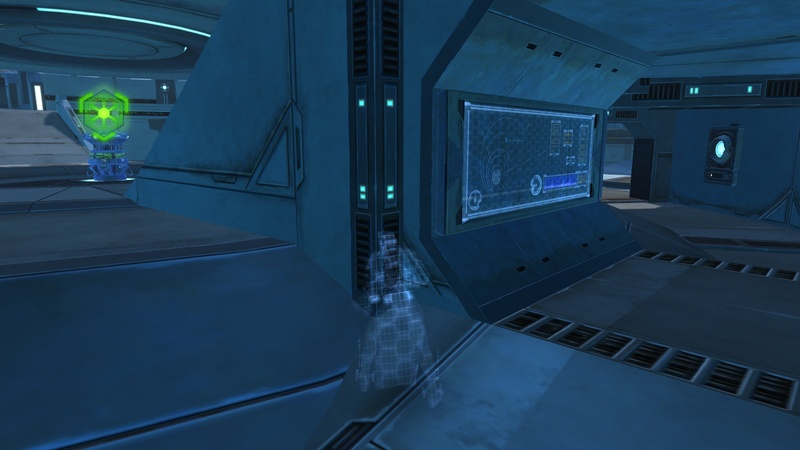 Upon being spotted, you can pop your Cloaking Screen and attempt to cap again a few seconds later. If and when interrupted yet again, you should enter the melee and fight on. The other method of offense is just plain joining the fray. If your group decides to attack a specific node with X amount of people, then you join in as part of the ranks. As with every other type of Warzone, the number one priority remains; focus down the healers! A good strategy to do when you’re in the midst of full chaos is randomly click the console. People are usually so busy in their battles that the last thing they expect is a person to attempt a capture. This is was by far my favorite Warzone leveling up. The reason being that I was the wild card. Sure, grabbing orbs and killing off your opposition in the middle yields you points, but nothing beats taking their pylon with 20 seconds left and having the enemy scramble to get it back to no avail. Though this alone COULD win a game (if done several times), it will not guarantee it. Your team still needs to do their part and defend their pylon, control the middle and turn in orbs. I've had instances where I've "ninja'd" the pylon two or three times and we still lose because the team never got into the middle and kept dying off. But again, that's up to the team for you are the wild card. Normally, you don't want to take the pylon on the first round because offs are that your opponents will enforce the pylon on the next reset, making it a lot more difficult for you. But, I've found myself taking it in the first few minutes because our team was just doing horrible. Around a minute left on the clock, you want to already be at their pylon. Reason being you want to scout for possible cloaked defenders, note visible defender movements, and keep track of orb runs. You don't want to go for the ninja grab when the opposition is already running towards you with orbs. What I usually do is wait until they turn it in and make their way back. With less than 45 seconds on the clock is when I ready myself to ninja cap. Keep in mind that you have 3 stuns, but using 2 will fill up the enemy resolve bar. In other words, they will be immune to stun number 3. So, you run to the pylon and after scouting for sometime, you can safely assume there is only one defender. An orb was just turned in and that guy is almost to the middle area. You target your opponent who is idly standing on the pylon. You make your way to him and Debilitate him. This pops you out of stealth immediately so, you click the pylon. Keep in mind that this is only 4 second stun so you will not cap the pylon. The point of doing this is to freak the enemy out into using their incapacitation cancellation ability. Once they pop it, Flash Bang them. If they used their CD before, you have successfully "ninja'd" a pylon. If they didn't, and used it against your Flash Bang instead, pop Cloaking Screen immediately. He's calling for backup but you can't do much about that. You have to wait for the resolve bar to reset. But, you have one last chance. When resolve is reset, Sleep Dart them while you are near the pylon, drop stealth, and click the pylon. If you're fast enough, you will take the pylon successfully. Note: You have 2 seconds from the CC to drop stealth and click the pylon because Sleep Dart will keep your opponent CCed for 8 seconds and it only takes 6 seconds to cap the pylon. Another way of going through the above strategy is the Sap Cap method. The strategy is identical except for using Sleep Dart instead of Debilitate. You will have to remember to click off Stealth once you Sleep Dart though because it does not drop you from combat. If you time it right, your opponent will have no choice but to pop his CD allowing you to Flash Bang him right after for the guaranteed cap. Note: Both strategies are effective! Use whichever makes you more comfortable. Credit goes to Ilmarinen of the ConcealedBlade forums for the Sap Cap tip! After all this, there wouldn't be much time left so odds are the pylon will stay yours before the pylon goes off and resets. This strategy will work against any and all classes that are standing near the pylon. Unfortunately, you will run into smart defenders that stand far away form the pylon. The best way to deal with them is with 2 stealthies. When you require 2 people, it gets trickier to ninja a pylon but its still entirely possible. It's not a complicated strategy but it does require team work, finesse, and a little but of luck. The goal would be for Stealthy 1 to be the distraction while Stealthy 2 caps. If there is only 1 ranged defender, Stealthy 1 should go through the CC rounds previously mentioned (solo scenario) as Stealthy 2 caps. If there are 2-3 defenders, Stealthy 1's job gets harder. Their job is now to distract them while Stealthy 2 caps. They key is to keep enemies facing away from the pylon long enough for the cap (6 seconds). Stealthy players are usually squishy so this needs to be done quickly. It's actually easier than it sounds. Most of my leveling days I played with another Operative and we dual capped pylons all the time against 2 to 3 defenders. Of course, one would assume the higher the level of PVP you partake in, the smarter the players will be. So, this may or may not work. And when it does work, it's a beautiful thing.